Israel’s high-tech expertise is being applied to milk and cheese. Dairy farmers from India to Italy are learning how to increase their yields by traveling to kibbutzim. And that’s no bull. In recent years, a handful of Israeli companies using locally-developed technology have come to dominate the world market for milk production systems and dairy herd management. Israeli companies Afimilk Agricultural Cooperative Ltd., based at Afikim, and the Netanya-based SCR Dairy, recently acquired by U.S. giant Allflex, have built milking parlors all over the world, including the United States, China, and Vietnam, and have dozens of other large projects underway. Akol, based at Kibbutz Bror Hayil, runs a database tracking the milk production of every cow in Israel; it recently signed a partnership with Microsoft to help make the technology globally available. Israel’s Agency for International Development signed a cooperation and information-sharing deal with India’s dairy sector last year. It is not just the dairy field that is seeing increased business. Israel’s overall agricultural technology (“agtech”) sector has grown in both global sales and foreign investment. 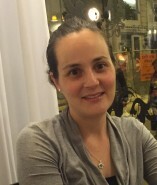 “The aspect of venture capital funds and multinationals coming to Israel to look for new agricultural technologies, and putting agriculture in the context of the startup ecosystem here is new,” said Nitza Kardish, chief executive of Trendlines Agtech, a division of the Trendlines Group, an Israeli company that invests in, incubates, and markets new products in several sectors, including agriculture and medicine. In April, Bayer AG announced it would invest $10 million in projects developed by the group. In September, Trendlines hosted its fourth annual AgriVest Conference, bringing hundreds of venture capitalists, multinationals, startups, and others in the field to Israel. Attendance surpassed that of previous years. “There is now synergy between high-tech and agriculture here, something we did not see five years ago,” Kardish said. This growth comes at a time of increased agtech investment globally, with startups in the field attracting $4.6 billion in funding in 2015, nearly double that of 2014, according to a report from AgFunder, an agricultural investment platform. The sector is expected to continue its rapid growth as farmers increasingly turn to new technologies in order to meet the growing global demand for food, which is expected to double by 2050, according to reports by the United Nations and other organizations. Like Israel’s high-tech industry, which has earned the country the popular moniker “Start-Up Nation,” the main attraction of the agtech sector is a history and culture of innovation. Although farming is often as traditional as it gets in most places around the world, innovation and the adaptation of technology to increase yields is becoming increasingly important, even to small farmers. This is a challenge for many farmers, especially in developing countries, where practices have remained the same for generations. But an innovative mindset has always been required in Israel, where the first agricultural projects were founded by Jews from Eastern Europe who had no background in farming. Due to Israel’s challenging climate and often inhospitable environment, farmers here have had to improvise, resulting in technology that has often set industry standards. A well-known example of this is Israeli water engineer Simcha Blass’s method of drip irrigation. Blass developed the technology in the 1960s, when Israel was trying to farm the Negev desert despite very limited water resources. The system was quickly adopted throughout Israel. Eventually, through the company Netafim, partly owned by the kibbutzim Hatzerim and Magal, it was put into use all over the world. “In Israel the people didn’t come with the heavy weight of tradition on their backs, they looked at it like a mathematical equation, and were not bogged down in an old way of doing things,” Langer said. This spirit of innovation and the cooperation encouraged by the socialist ideology of the kibbutz movement have been institutionalized. That is what the visitors to Afikim wanted to see. This particular group was made up of farmers from New Zealand, Australia, and several European countries, who were on a six-week trip to study different farming methods around the world, funded by the Nuffield Farming Scholarships Trust, an Australian organization that works to advance agricultural knowledge. 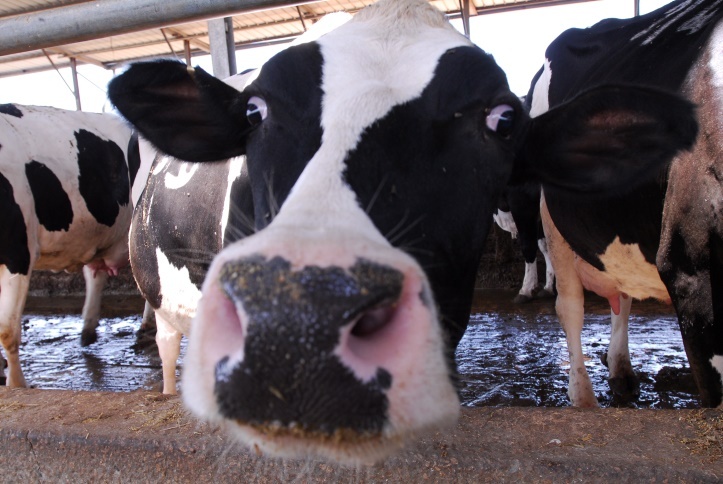 Not only has the dairy herd at Afikim sustained the kibbutz and contributed to Israel’s milk supply for decades, it is also the laboratory for the kibbutz-owned company Afimilk, a major player on the global stage. Afimilk provides wireless systems to track cow behavior and milk production, as well as manage barns and milking parlors in 50 countries. These monitoring and management systems help increase milk yields by quickly identifying factors like infections that reduce milk output, as well as indicating which cows are currently fertile. “We have about 30 percent of the global market share, which means we are managing millions of cows,” Daniel Hojman, Afikim’s professional services manager, told the visiting farmers as he gave them a tour of the company’s office on the kibbutz. Inside it looks like the office of many high-tech companies, with hardwood floors and an open architectural plan. Hojman gives tours to foreign visitors at least once a week, as Afimilk has become a must-see for Israel’s growing number of dairy tourists. Other popular stops on such tours include cow-monitoring company SCR Dairy, feed centers, small family-owned farms, and the Volcani Center, a government-funded research institute. The hallway of Afimilk contains a timeline for the company going back to 1977, when Afikim founded a company called Special Agricultural Equipment, or SAE, with the hope of developing new products to help kibbutz farmers. One founder of SAE, an engineer named Eli Peles, sought to develop a better way to monitor each cow’s milk output. “Eli was an inventor, people would tell him, ‘try this,’ and he would figure out a way to do it,” recalls Ralph Ginsberg, a retired dairy cow specialist who worked with Peles and is now an international consultant. Traditionally, milk output was measured by attaching a glass jar etched with numbers to the hose collecting the milk from a cow’s udders. After each cow was milked, the jar would be checked and the amount would be recorded. In 1979, Peles and his team changed all this by developing the world’s first electronic milk meter. The meter is a small container attached to the milking hose. It uses an electric current to automatically measure each cow’s output as the milk passes through, eliminating the need for the glass jars. “The milk meter made a huge difference,” Ginsberg noted, but was only the first step. Peles and his team connected the milk meters to personal computers, newly developed at the time, in order to create databases that tracked milk output. Other kibbutzim began to use the milk meters, Ginsberg said, and began contributing to national databases. Eventually, the milk meters grew more advanced and began to measure other factors such as the composition of protein and fat and the concentration of somatic cells, which can be an early indication of infection. The company has also developed wireless sensors attached to cows that track their behavior, such as how often they move and lie down, which can indicate when they are fertile. All of this data is stored in the cloud and can be accessed by farmers from mobile devices or computers. The data can also be used to automate other systems, such as temperature control, as well as sorting cows depending on whether the sensors indicate they are sick or if they are ripe for insemination. Meeting these needs contributes to better milk production. Afimilk has not only helped increase milk production, but the global sales of its products have given the kibbutz a much-needed economic boost, especially since the 1990s, when it, like many other kibbutzim, began to suffer from mounting debts and financial challenges. In addition to economic problems, the kibbutz’s socialist ideology began to fade as more members took jobs outside the kibbutz and Israel adopted an open, capitalist economy. It was ultimately privatized in 2004, meaning that members are responsible for earning their own income and supporting themselves, although they still receive some subsidized services from the kibbutz. Today only a few of the 200 employees at Afimilk are from the kibbutz. But it is largely due to the continuing success of Afimilk that the kibbutz can fund services such as an old-age home, child care, and a swimming pool. In fact, Kibbutz Afikim is growing, absorbing about 100 new members over the last few years. 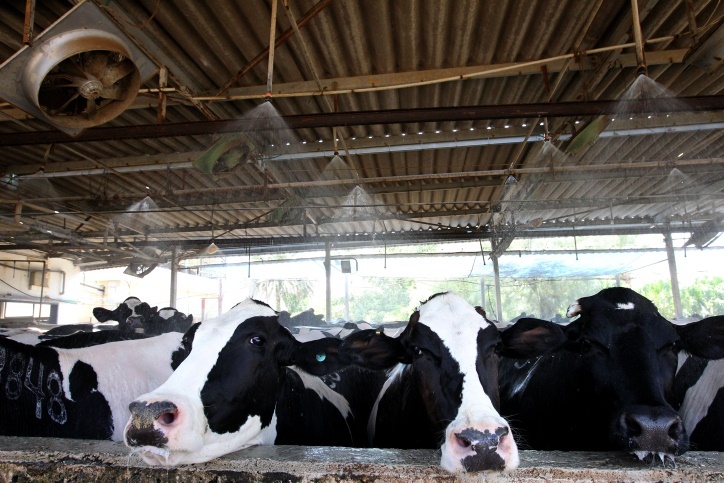 Although Afimilk’s largest market is the United States, one of the main factors driving its growth, and that of Israel’s milking technology sector in general, is the growing demand for dairy products in the developing world. In some markets, like China, diets are changing to include more milk and cheese. In other places, like India, where milk has long been a staple, population growth is forcing the dairy industry to become more efficient. These countries, in addition to Europe, provide most of the visitors to Langer’s dairy school, which is based on Kibbutz Degania Bet, just a few minutes’ drive from Afikim. At Degania Bet, the kibbutz’s dining room is serving lunch. At one table are several visitors from India, Italy, and Belarus. Like the Nuffield scholars, they are also farmers touring Israel and are about to complete a 10-day course at the Israel Dairy School. Among them is Deepak Kindo, who opened a commercial dairy farm in eastern India two years ago in order to tap into the growing consumer demand for milk products. With 250 dairy cows, the farm is currently the largest in the Indian state of Odisha. But Kindo would like to make it more efficient. He still uses simple milking equipment rather than milk meters or cow sensors. Back in India, he has visited dairy farms that were built according to ideas acquired during visits to Israel. 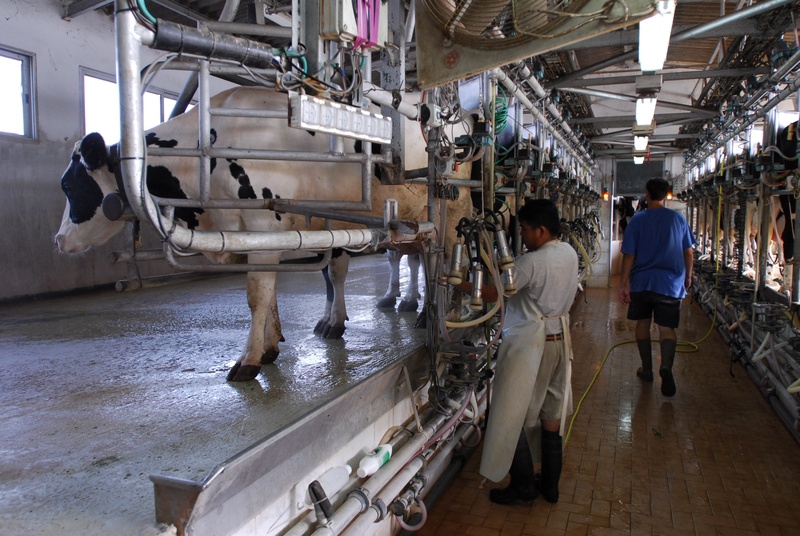 After reading more about the industry online, Kindo decided to attend the dairy school. He wants to learn how Israeli technology can help him, but his vision is much larger than just making his own cows more efficient. He studied business at university, and now runs a microfinance company, which he hopes to combine with his knowledge of dairy farming in order to spur the establishment of more efficient milking parlors. Most local dairy farms in India consist of just three or four cows, and resource shortages and poor management plague much of the industry, according to a report from the U.S. Department of Agriculture’s Global Agriculture Information Network. Kindo said that the Israeli dairy industry, which also faced the problem of limited natural resources, is an inspiring story and can be a model for India. “We are not just selling milk but we are creating a new culture, and that’s a huge challenge but a huge possibility,” he said. He is not alone. While the dairy school participants attended a seminar, Langer, the founder, took out his phone and showed me messages from farmers in Vietnam, China, Nigeria, and other places who have written to him inquiring about the program. He shows me his Facebook page, which demonstrates the diverse interest in the program, including from Arab countries. While his dairy school program is small, he hopes to continue expanding it. This is very much a dream for him, because he wants to use the dairy industry as a way to teach people not just about cows but about Israel. In an era when Israel faces growing criticism and calls for economic isolation, programs such as the dairy school can bridge gaps in understanding. Not only will people learn that industry thrives in Israel despite the ongoing conflict, but also about the Jewish connection to the land and how agriculture has nourished that relationship, Langer said. In addition to farms, kibbutzim, and other dairy-related sites, he takes his groups to visit various holy places, historic sites, and Yad Vashem.